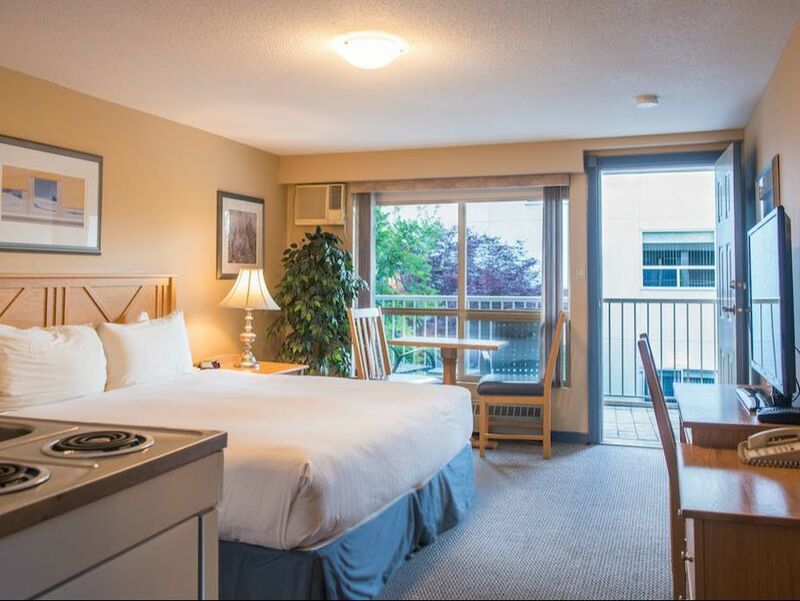 Accommodation options at the Hilltop Inn Salmon Arm hotel are arranged between two distinctive buildings. The Main Building consists of 47 spacious, richly appointed guest rooms with views of the lake, mountains, forests, gardens or pool. Select hotel rooms also boast poolside patios. The Oasis Building contains 24 traditional guest rooms and is located across the courtyard from the Main Building. 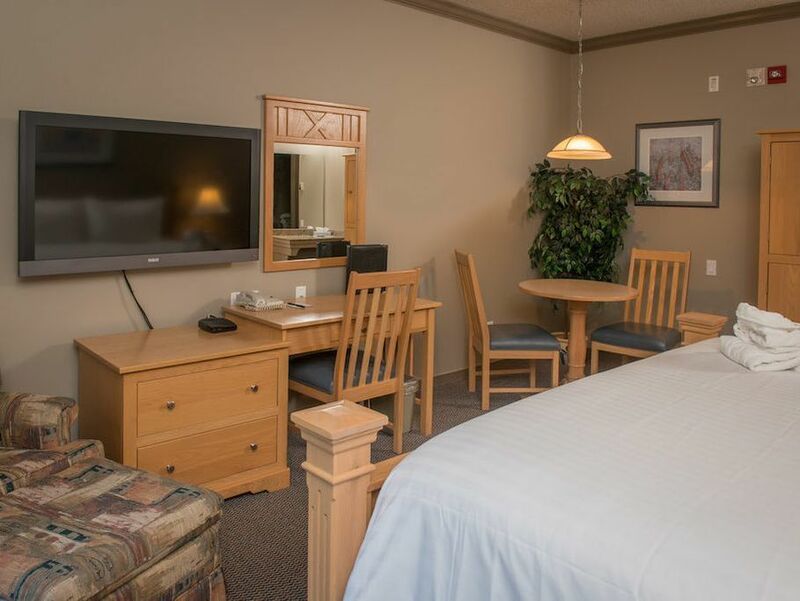 Oasis accommodations enjoy all the amenities of the main building including complimentary wireless Internet, complimentary continental breakfast buffet, HDTV and licensed room service from Table 24. All rooms have a private poolside patio or balcony and exterior entrances. 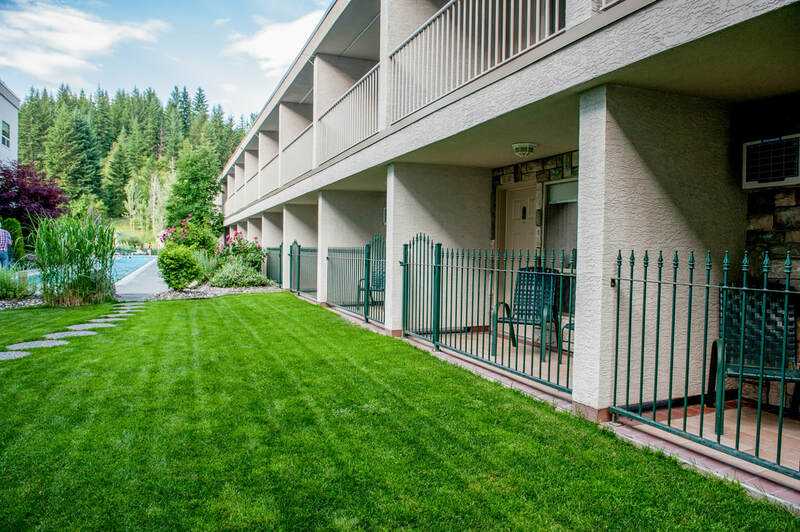 Enjoy quick access to the pool and to complimentary parking! ​The ground level floor of the Oasis building is pet-friendly, offering very convenient access to the great outdoors for your furry friends. 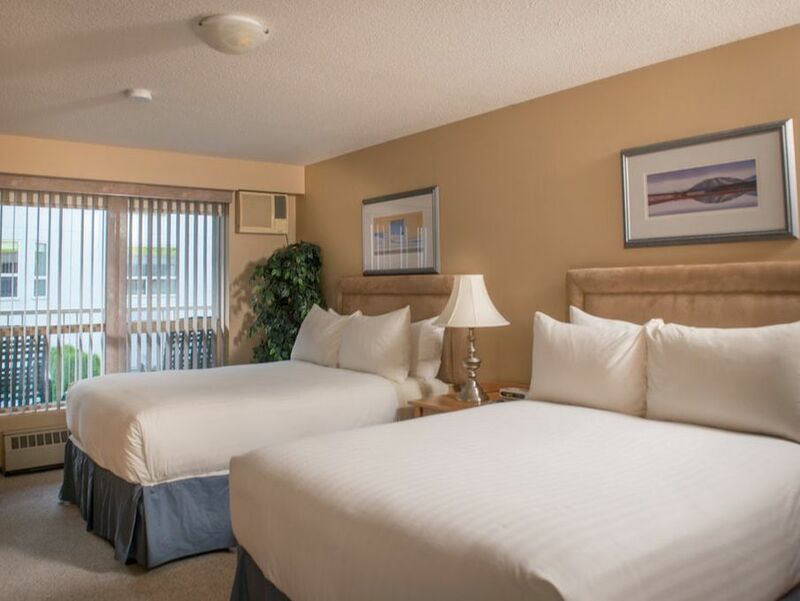 No matter which accommodations you choose, a great night’s sleep is guaranteed. Every mattress in every room is custom built by Simmons to exact Hilltop specifications, ensuring an amazing sleep experience. 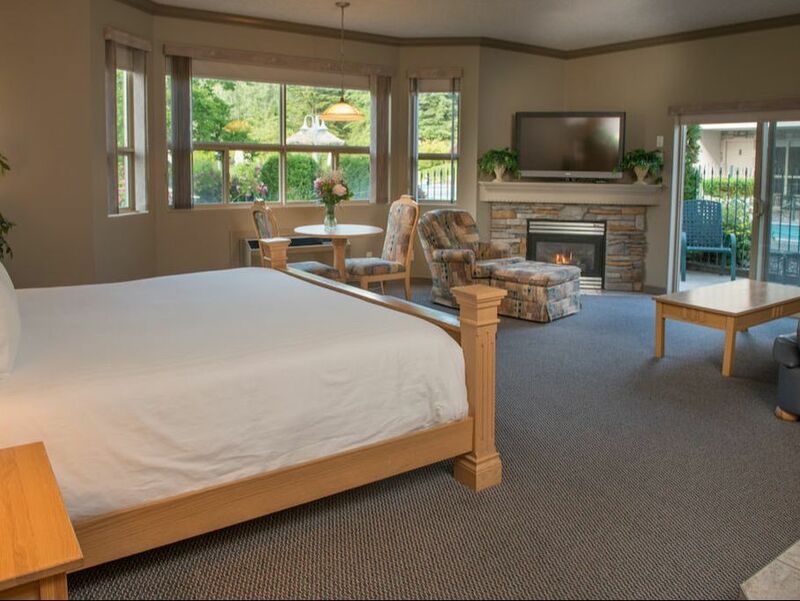 Located in the Inn, this room features two Queen beds with custom-made pillow top Simmons mattresses. 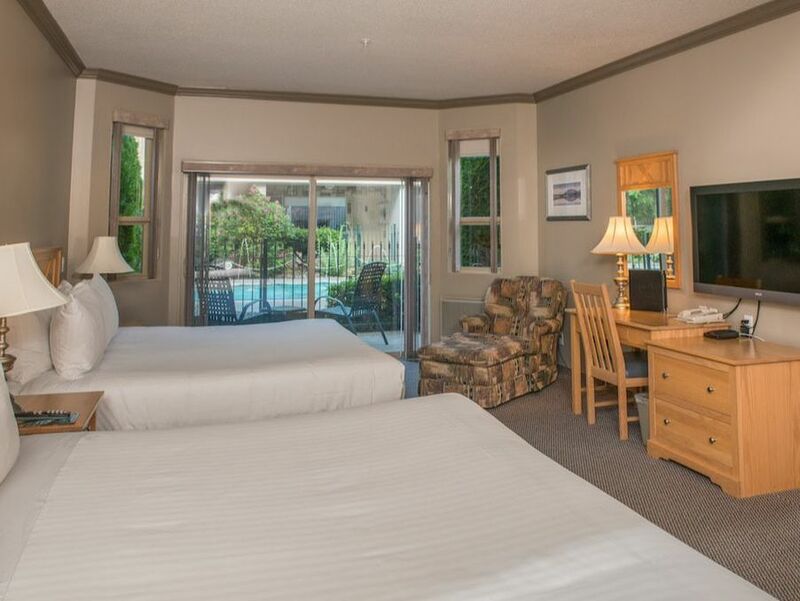 Enjoy views of the seasonal outdoor pool, gardens, forest or Shuswap Lake. Measuring 450 square feet & located in the Inn, this room features two Queen beds with custom-made pillow top Simmons mattresses. Enjoy direct access to the seasonal outdoor pool and gardens. Measuring 425 square feet & located in the Inn, this room features two Queen beds with custom-made pillow top Simmons mattresses. 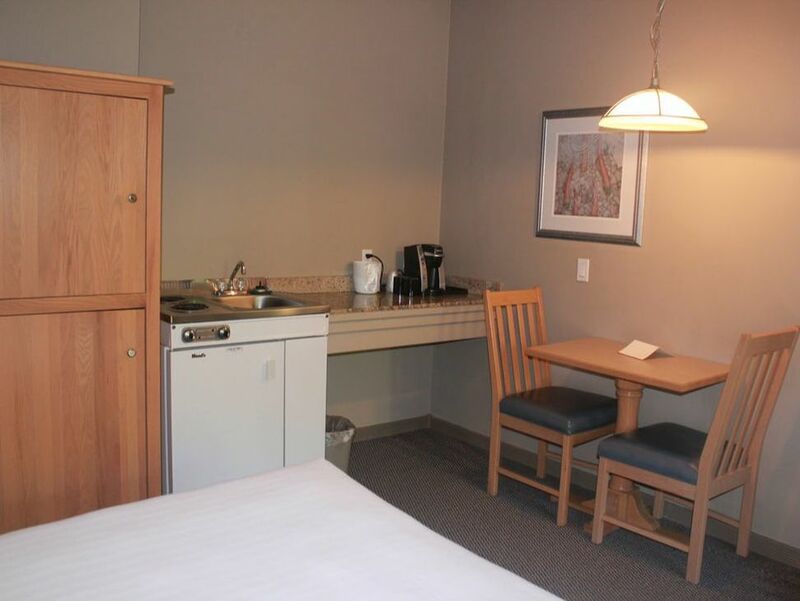 Additional amenities include a kitchenette and a large walk-in shower. Enjoy views of the pool, gardens and forest. Measuring 450 square feet & located in the Inn, this room features one King bed with a custom-made pillow top Simmons mattress. 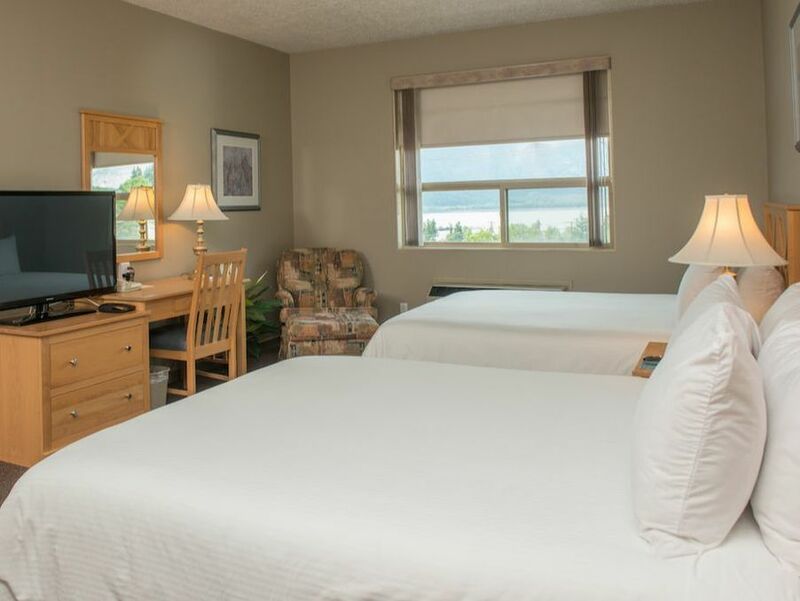 Enjoy views of the mountains and Shuswap Lake. 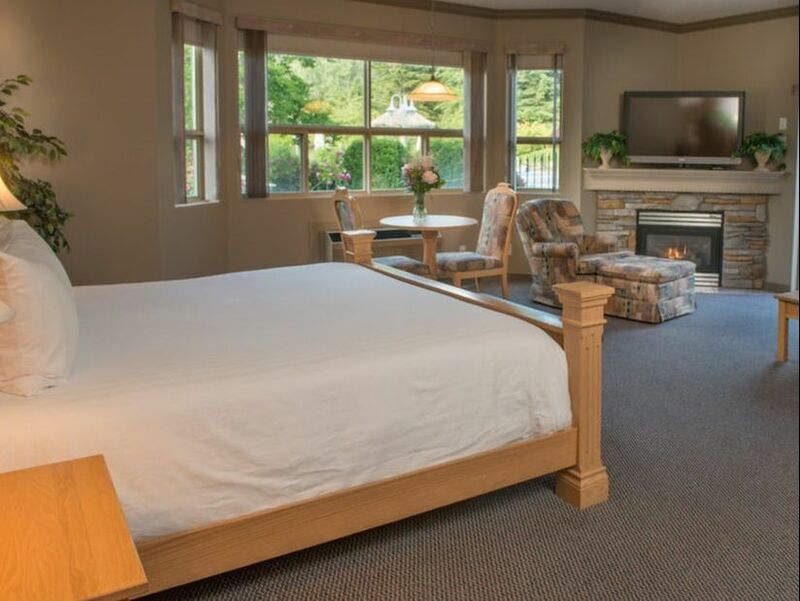 Measuring 457 square feet & located in the Inn, this poolside room features two King beds with custom-made pillow top Simmons mattresses and a large walk-in shower. Enjoy views of the pool, gardens and forest. There is a small poolside patio with direct access to the seasonal outdoor pool. Measuring 520 square feet, this L-shaped suite located in the Oasis building features two Queen beds with custom-made pillow top Simmons mattresses as well as a large walk-in shower. Enjoy the views of the outdoor seasonal pool from your private balcony. Measuring 660 square feet & located in the Inn, this suite features two King beds with custom-made pillow top Simmons mattresses. 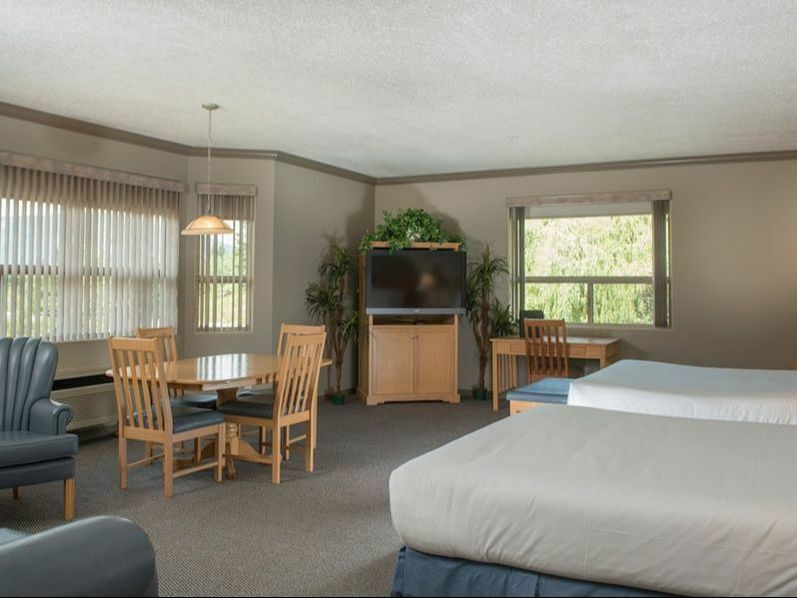 Additional amenities include a convenient walk-in shower, a large soaker tub, a sofa bed, table and 4 chairs. Measuring 540 square feet & located in the Inn, this suite features one King bed with a custom-made pillow top Simmons mattress as well as luxurious linens and duvets. Enjoy views of the pool, gardens and forest. Bask in the Jacuzzi by the fireplace. This room also includes a sofa bed and a dual head large walk-in shower. Measuring 457 square feet & located in the Inn, this poolside suite features one King bed with a custom-made pillow top Simmons mattress as well as luxurious linens and duvets. Bask in the Jacuzzi by the fireplace. This room also includes a sofa bed, a dual head large walk-in shower and a small poolside patio with direct access to the seasonal outdoor pool. Measuring 457 square feet & located in the Inn, this pool view suite features one King bed with a custom-made pillow top Simmons mattress as well as luxurious linens and duvets. Enjoy views of the pool, gardens and forest. Bask in the Jacuzzi by the fireplace. This room also includes a sofa bed and a dual head large walk-in shower. Located in the Oasis Building, this room features two double beds with custom-made pillow top Simmons mattress. Enjoy views of the pool or gardens from the private balcony. This room is accessible by an outside entrance and up one flight of stairs. Located in the Oasis Building, this one-bedroom suite features a custom-made Simmons pillow top King bed and a sofa bed. 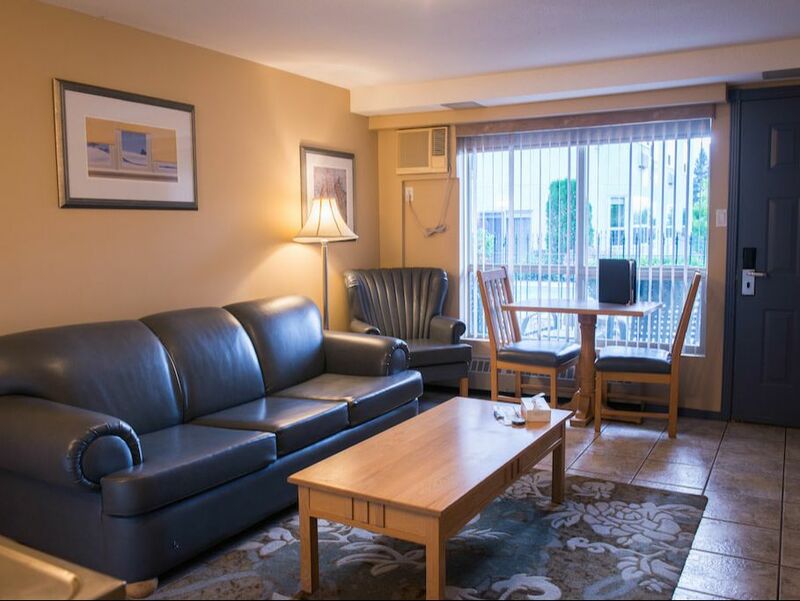 Enjoy the private patio with direct pool access, a kitchenette, ceramic tile flooring, a living area, a down duvet and other amenities to make your stay more comfortable. A $15 pet fee will be charged to the room per pet, per night. 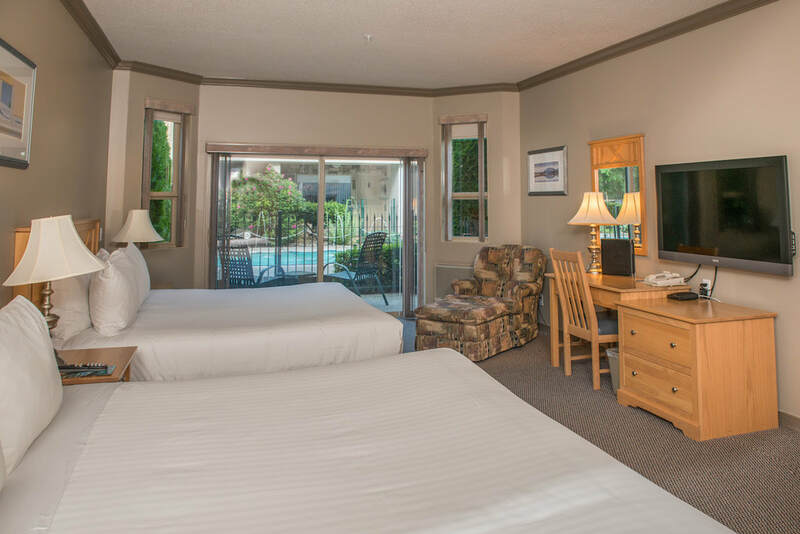 Located in the Oasis building, this 200-square-foot room features a custom-made Simmons pillow top King bed, a kitchenette, a walk-in shower, and a flat-screen TV. Enjoy views of the pool or gardens from the private balcony. This room is accessible by an outside entrance and up one flight of stairs. Located in the Oasis Building, this room features two double beds with custom-made pillow top Simmons mattress, a walk-in shower and ceramic tile flooring. Enjoy the private patio with direct pool access. A $15 pet fee will be charged to the room per pet, per night.